Hockey Canada is very excited to announce that, in conjunction with 2017 World Junior Championships, we will be offering Development Programs to players and coaches of all ages and skill levels. These development programs will take place at the MasterCard Centre for Hockey Excellence in Toronto, ON; the Official Practice venue of the WJC. Hockey Canada's Initiation Program makes children's first contact with hockey a safe and positive experience. It's a structured, learn-to-play hockey program designed to introduce beginners to the game's basic skills. It enables participants to become contributing members of a team effort, develop self-confidence, and experience a sense of personal achievement. These goals are achieved in an atmosphere of fun and fair play. THE IP FESTIVAL REGISTRATION IS FOR TEAMS ONLY. IF YOU ARE A TEAM OFFICIAL, YOU MAY REGISTER YOUR TEAM. IF YOU ARE A PARENT OF AN IP PLAYER, PLEASE CONTACT YOUR TEAM MANAGER TO REGISTER YOUR TEAM. The cost of the program is $250 per team. Should there be additional spots available to individuals on the waitlist, the cost will be $25 per skater. This registration cost includes the ice session and a limited edition Hockey Canada jersey for all participants. In addition, all registered participants will receive one complimentary ticket to a World Junior Championship Game between Slovakia vs. Latvia on Friday, December 30th, 2016. Additional tickets are available for purchase. This program is limited to 3 teams in each Initiation Program age group. Individuals on the waitlist will be placed with one of the groups - pending availability. The Atom Cross Ice Jamboree sees teams play the width of the ice instead of the length, allowing for more chances to pass, shoot and stick-handle and less time spent chasing the puck up and down the entire rink. The final goal is to provide more time playing – and less time waiting for the next shift and statistics have shown Cross Ice Jamborees will improve the players’ skill and increase their enjoyment of the game. THE ATOM CROSS ICE JAMBOREE REGISTRATION IS FOR TEAMS ONLY. IF YOU ARE A TEAM OFFICIAL, YOU MAY REGISTER YOUR TEAM. IF YOU ARE A PARENT OF AN ATOM PLAYER, PLEASE CONTACT YOUR TEAM MANAGER TO REGISTER YOUR TEAM. Minor Hockey Teams in the ATOM age group may sign up here. All players receive a limited edition Hockey Canada development camp jersey. Plus, each participating player will receive 1 (one) ticket to a World Junior Championship Game between Russia vs. Latvia on Tuesday, December 27th, 2016! Additional Tickets are available for purchase during the registration process. The Coach or another Team Official is responsible for registering the entire team for the program. The cost is $250 per team. 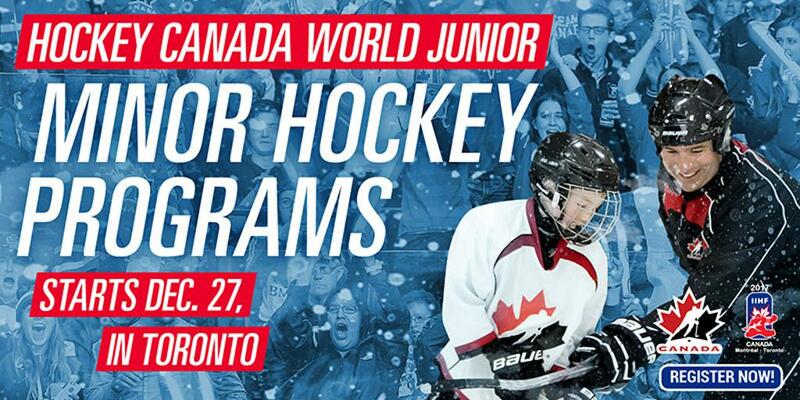 Visit our World Junior Programs page for the full schedule of Hockey Canada World Junior programming happening in Toronto this holiday season!